[W]e went from 250 songs everyone knows to 250,000+ songs nobody knows (Murrow). I experienced some frustration this past Easter for this very reason. The songs that were chosen for the Easter service were all appropriate thematically, but almost all were new to me. I’m pretty quick to catch onto songs, so it wasn’t really an issue of not being able to sing them. I am obviously not the same as the men who don’t sing in the Murrow post. But there was something else that I realized that we’ve lost since hymnals have become obsolete. And it has to do with the way we view time. In our culture, we understand time to be exclusively chronological. So much so that many who are reading this are saying, “Well, what the heck else would time be?” Chronological time, or “secular” time, is the idea that one thing happens after another. 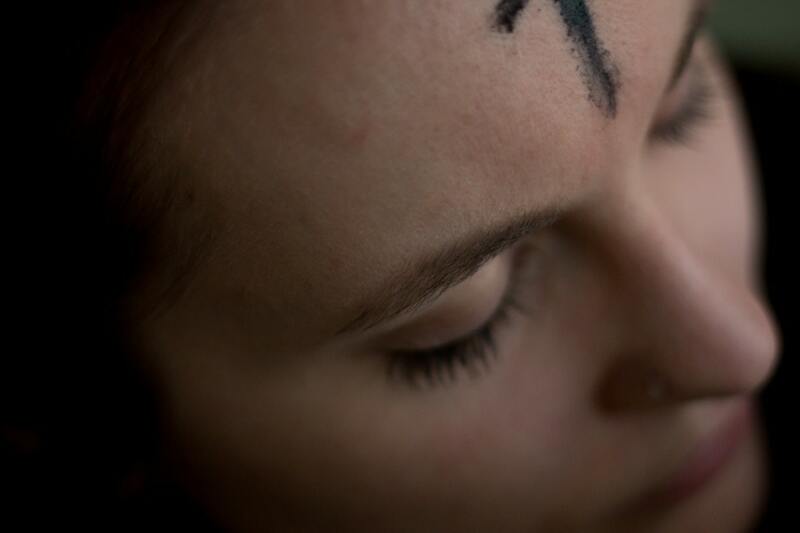 There is no meaning behind this ordering of events–it is ordinary time. Higher time (kairos) is infused with meaning. It doesn’t replace ordinary time but complements it. Higher times “gather and re-order secular time” (Taylor 55). If you think of chronological time as a long rope, higher time takes that rope and ties it in a knot so places on the rope that are usually further apart, are now touching. These “kairotic knots” (54) meaningfully reorder time. So, your birthday 2013 is closer in kairos time to your birthday in 2012, than it is to the other days that lie between them. This is because your birthdays all share the same meaning and the ordering of kairos time is one of meaning. In the secular world, this is the only sort of time there is and I think we lose something if we view time as a mere sequence and neglect this other way of experiencing higher time. What does this have to do with praise and worship songs? I think the songs we sing in church can go a long way in helping us to experience higher time. The principle is the same with Christmas. We also sang the same songs at every funeral, and after the offerings were collected. The songs linked these events to each other in higher time. The modern, secular view of reality is an impoverished view. This view of reality ought to be countered at every point if people are going to experience a life of fullness available in Christ. Certainly, the songs that we sing can help us to experience time as meaningful, but all aspects of communal worship can be looked at. Perhaps a little more attention given to the traditional church calendar is worth a look. I’ve sung this song quite a few times and I have never sung it in the same way twice. That’s a good thing; we won’t always experience good poetry, good art of any kind, the same way. We will, however, experience bad poetry the same way every time. I’ve read Hamlet many times and it still surprises me. The same can be said for the songs of Josh Garrels and the book of Genesis. The best church songs will have the same quality. The presence and power of the figurative language contribute to the effectiveness of a song to bring some listeners into worship. The next time I noticed that this phrase was preceded by the word “these.” This demonstrative pronoun puts the ashes I’m singing about right here–I walked into church covered in them. In Biblical language, to wear ashes, or “sackcloth and ashes,” is to demonstrate grief or repentance; importantly, it is an act of humility. This song, if sung honestly is a song of confession where the worshiper acknowledges his or her sin and the need for forgiveness. By grace, these ashes are exchanged for beauty the song reminds us, for we are transformed to royalty as a crown is placed upon our heads. We aren’t just forgiven but received as children of the King. This transformation occurs, not by our merit, but by the death of Jesus on the cross. We sang this song in church again a few weeks ago. I was caught by the line “Coming to kiss the feet of mercy.” In Luke 7:38, there was a woman who had “lived a sinful life”–Luke doesn’t say she was a prostitute, but this is certainly likely. When I sing this line, I am placed in the position of a prostitute. This is the point and the power of the line. I cannot judge others when I remember that my sin is no less than that of the woman in Luke. But my guilt, as well as the woman’s, is, nonetheless, erased by Jesus death on the cross. She wept and wet his feet with tears and wiped them with her hair. This is the response that this line can evoke in those who sing it–overwhelming gratitude. This is only one verse: there are two more that are just as powerful. 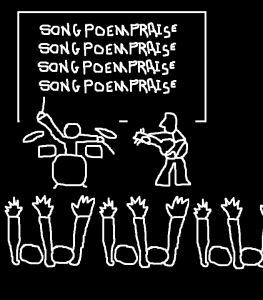 Not all the songs that we sing in church use metaphors like this–nor need they. Metaphor and allusion are but two tools that the poet might use. And there are many tools. However, when figurative language is used in a song, it should work to achieve the purpose of the song–in this case, lead those who sing it into confession–an awareness of one’s guilt and gratitude in complete forgiveness. This is an example of how figurative language (and allusion) can work powerfully in a song. 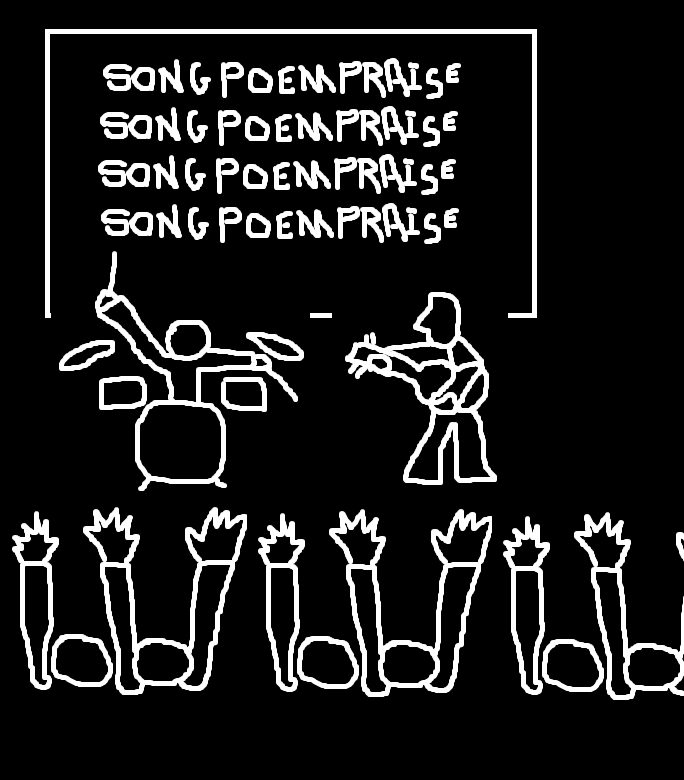 But then there are those praise and worship songs where the figures of speech get in the way of, well, praise and worship. For more of the tools to write (and select) Praise and Worship songs for corporate worship, please check out The Poetry of Worship. I used to have sheep, about a dozen ewes and a big ram named Joe. This combination resulted in about twenty lambs in the spring. Once these little ones discovered the wonderful world beyond the teat, they became a huge problem. The ewes and Joe would happily eat the grass in the center of the field, but the young ones would walk around the perimeter of the pasture always testing the fence. If there were any weakness, they’d be out in no time. In the Modern West, we worship Freedom–our understanding of it. We think of freedom in socio-political terms. We must fight for freedom from those who would take it away. We’ve recast history to become the story of shaking off oppression. The ancient conception of freedom is much different. To ancient peoples, the threat to freedom wasn’t other people and institutions, it was the lack of wisdom or virtue. My experience with my sheep tells me that the ancients have the truer understanding of freedom. If my young sheep could get out, they would. This is a problem; outside the fence was death. Death came in two forms. The first was coyotes. 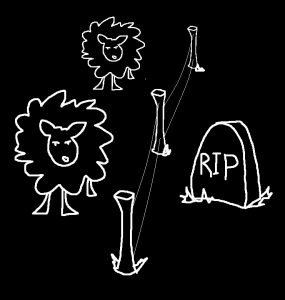 I don’t suppose any further explanation is needed on this point, but let’s say there no sheep would survive the night. The second threat was grain. I had a lot of whole corn and high protein pellets on the farm to feed the 4,000 pigeons. There were also various grain-based feeds for the cows, sheep, pigs, and horses. If these lambs got into any of this feed they’d die. Their behavior was predictable—they’d gobble up too much for their digestive systems to handle. The next morning I’d find them with their legs sticking in the air. Sheep eat grain with a kind of desperate ecstasy. I know this because we fed it to them regularly. A few cups per day. If you ask a young sheep what he’d wish for if he could have anything, he’d ask for a pile of grain, and, the next time you saw him, he’d be on his back and his tongue would be blue. 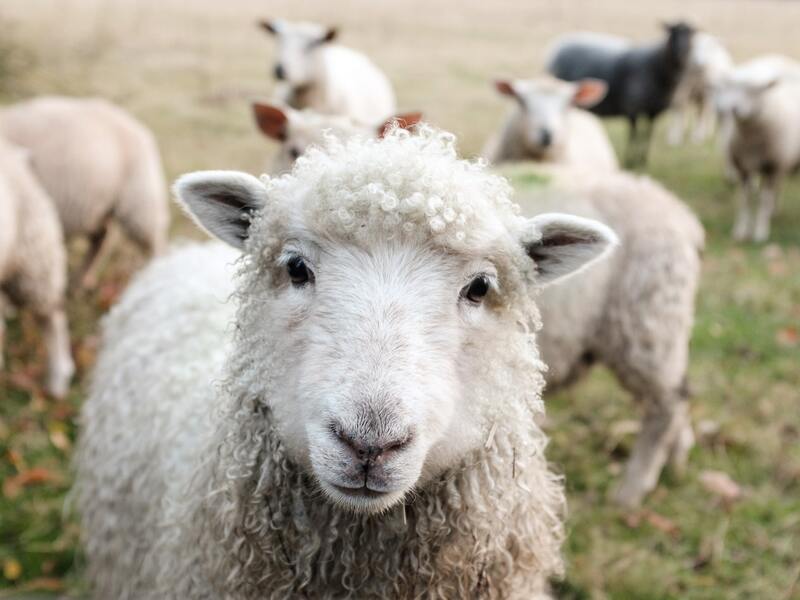 When the Bible refers to people as sheep, don’t picture the white fluffy ones you see in all the Sunday school books. Picture one that spends all day striving for the glorious freedom beyond the fence. In Modern terms, freedom comes from opposition to the fence put up by the evil farmer. In ancient terms is freedom means understanding, or at least trusting, that death can come through personal indulgence as easily as though external threats. Sheep just don’t seem to understand that true happiness and freedom lie within the boundaries of the fence. Zombie films evoke the fear of how people would respond if there were no authorities to keep the baser appetites in check. I must admit, for me this is the source of zombie terror for me. Without the authority represented by the government or any transcendent moral authority, human beings turn on each other. This fear of others—indeed, of one’s neighbours—is the basis of Hobbes’ analysis in Leviathan published in 1651. The zombies usher in a world where the Monstrous Humans invoke their natural right “even to one another’s body,” and they can do this because there is no longer a “sovereign” to enforce the contracts that Hobbes describes. The loss of authority is central to zombie narratives. Zombies are certainly horrifying in and of themselves, but, as Bishop points out, “such monsters would not pose much of a threat if actualized in the modern-day world; most probably police or military could quickly exterminate these aberrations” (22). 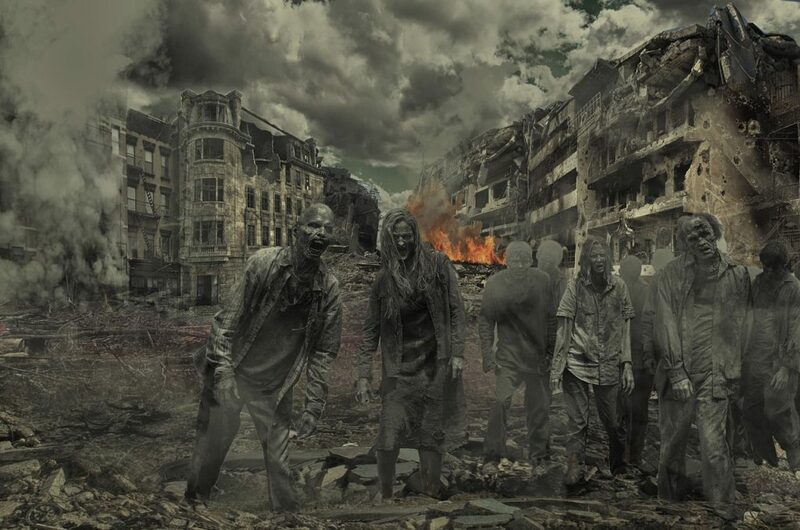 Zombie narratives are almost always set during (or shortly after) the collapse of civilization, and whatever remains of the police or military, or any other governmental organization, is completely ineffectual and more often, nonexistent. Zombie movies, then, “offer a worst-case scenario of the collapse of all American social and governmental structures. Once people start to die at an uncontrollable rate, panic rages through all levels of the government and the military—a literal ‘dog eat dog’” world” (Bishop 23). At the end of Night of the Living Dead, the zombies have been contained and are in the process of being eliminated; by the end of Dawn of the Dead, they have apparently overrun everything. Government, military and all other forms of civil authority evaporate. According to Hobbes, the sovereign is supposed to establish “security and order, enforcing our agreements with others, resolving disputes, and imposing punishment. Hobbes’ sovereign also determines the ideology of the state (what is right and wrong, just and unjust). Under his authority, good and evil are absolute” (Fahy [The Philosophy of Terror] 65). In the absence of such authority, there is no absolute ‘good’ and ‘evil.’ Because culture has reverted to a raw state of nature, only desire and aversion exist. In the absence of “good” and “evil,” each individual determines his or her own morality. We desire what is good and have an aversion to what is bad. But individual desires and aversions are pursued at the expense of those of others. This is the role that the other, monstrous, humans play in zombie narratives. The biker gang in Dawn of the Dead invades the mall to pillage it, and they will kill anyone—living or undead–to have their way. Because the living and the undead are both driven by almost equally base desires to “consume” the other, the zombie holds up a mirror to man, revealing what he is in a world without authority. The line between monster and human is blurred.